Exploring coffee cultures around the world. Follow two caffeine junkie-backpackers searching for the world’s best coffee! The quality of a cup of coffee is determined by a complex combination of factors, both environmental and method of preparation. Since altitude, soil quality and climate are influential factors, the bean origin influences coffee quality. These were our favorite coffees around the world. Making coffee with a view. 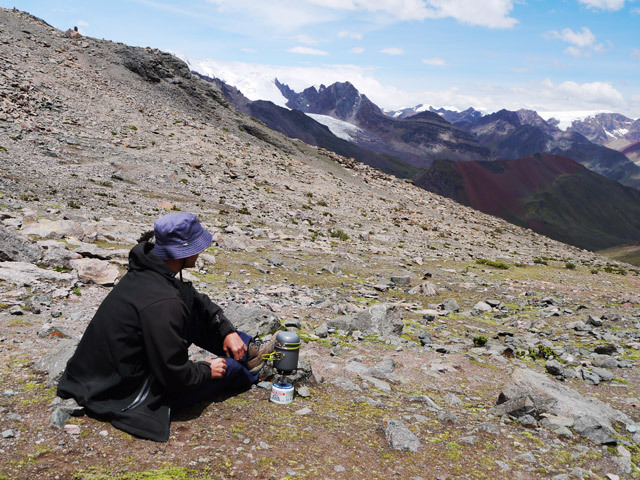 4500m above sea level stopping for a coffee break on Mount Ausangate in Peru. Coffee culture here varies between nothing and top quality around here. Indonesia is a big player, the fourth biggest coffee producer in the world. It produces many of the world’s top quality coffees; the world’s most famous blend Mocha Java originates in Java Island. Indonesian specialty coffee was made famous by the movie ‘The Bucket List’. Kopi Luwak also known as ‘poop coffee’ is one of the most expensive coffees in the world. A type of weasel, a civet, consumes the coffee cherries, leaving the coffee beans to be collected later from the animal’s feces. The unique aroma is attributed to fermentation processes taking place inside the digestive track of the civet. It is also said to be due to selection, since the civets only eat the best beans their poop makes the best coffee! 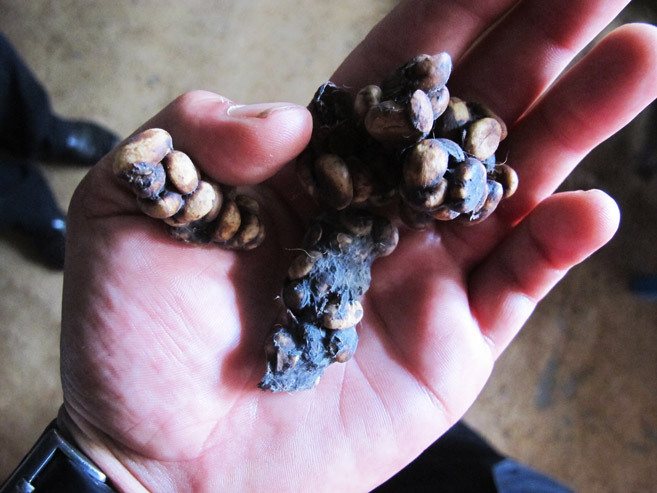 Civet poop, used for making Kopi Luwak. You can see mostly made up of coffee beans. We spent a couple of months around Indonesia, the local coffee was called Bali Coffee on most islands. In restaurants you can usually choose between a Bali Coffee brewed in a pot and an Americano made with espresso for triple the price. In the mountains around Tana Toraja on Sulawesi Island I tasted some of the best coffee I have ever had. I thought Kopi Luwak is just a nice cup of coffee and did not feel it justified the price. Kopi Luwak the controversy Traditionally, civet weasels prowl coffee plantations at night, selecting the best beans for dinner. The droppings are collected in the plantations to make Kopi Luwak. Some farms however keep the civets in battery cages feeding them only coffee beans, cruel and since the civets eat all the beans there is no selection of beans by the civet. Vietnamese coffee is famous for being super strong, dark roasted robusta bean coffee served with sweetened condense milk. 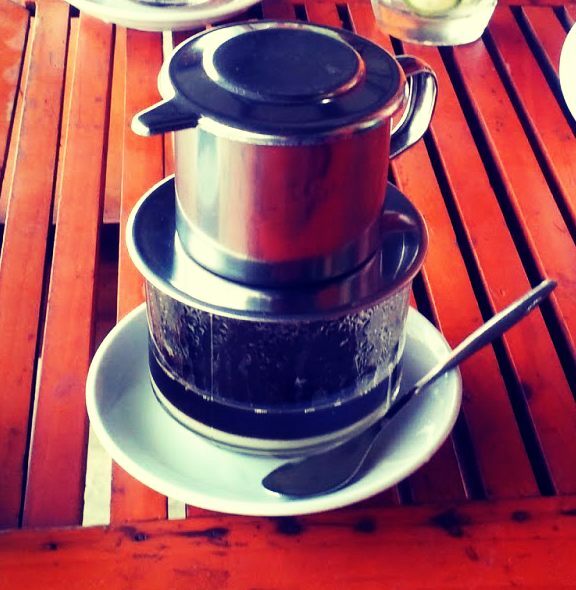 Coffee in Vietnam is serious business, they are the second largest coffee producer in the world! Coffee is traditionally brewed in individual portions using a phin, this is a small filter chamber with a lid. It is placed on top of a glass filled with some condensed milk, catching the coffee slowly filtering drop by drop. A phin slowly dripping coffee into a glass of condensed milk. We crossed Vietnam north to south by motorbike and stopped every hour or two for a coffee somewhere next to the road. Vietnam is the biggest exporter in the world of robusta coffee beans. This bean is commonly used for making instant coffee and makes more bitter coffee than arabica beans that is used in blends of quality coffee beans. The slow dripping process and robusta beans result in a very strong, bitter cup! Vietnam also produces ‘poo coffee’. Similar to Kopi Luwak, it is passed through the arse of a civit weasel, they just call it Cafe Chon. I saw some of these animals in cages in Dalat on a coffee farm, not a pretty sight. Traveling here is a coffee lovers dream! Guatemala, El Salvador, Honduras, Nicaragua and Costa Rica. Sounds like the coffee bean names in your local coffee shop? The best thing here is quality coffee is dirt cheap! It is a small area, but the countries have distinct micro-climates resulting in different and unique coffees being produced in each country. Guatemala with its lush nutritious soils produce some of the finest coffees in Central America. Currently the tenth biggest coffee producer in the world. 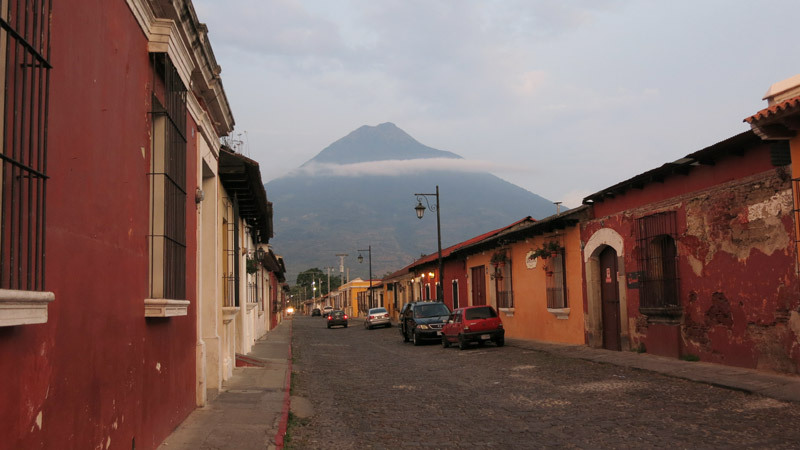 Coffee heaven, the beautiful colonial town Antigua, surrounded by 3 volcanoes! We loved Antigua, this beautiful colonial town is located in a valley between three volcanoes. Unreal, picturesque this town is perfect for coffee production, located at altitude with high humidity and heavy rainfall. Guatemala, traveling in crazy, colorful chicken buses, living on tropical fruit, tortillas and amazing coffee! Costa Rica is a unreal beautiful country, producing heavenly coffee. Heavy rainfall, high altitudes and soil enriched by volcanic ash creates a perfect environment for top quality coffee production. Costa Rica is the only country in the world where it is illegal to produce any type of coffee other than 100% Arabica, planting of low quality beans is against the law here! Even cheap coffee here is great quality! Most hostels had a wood stand with a coffee net in which they made free coffee all day! Spending a morning in a coffee roaster in Antiqua is a bucket list experience coffee lovers should scribble in. El Salvador is the smallest Central American nation, but still produces a significant quantity of high quality coffee. 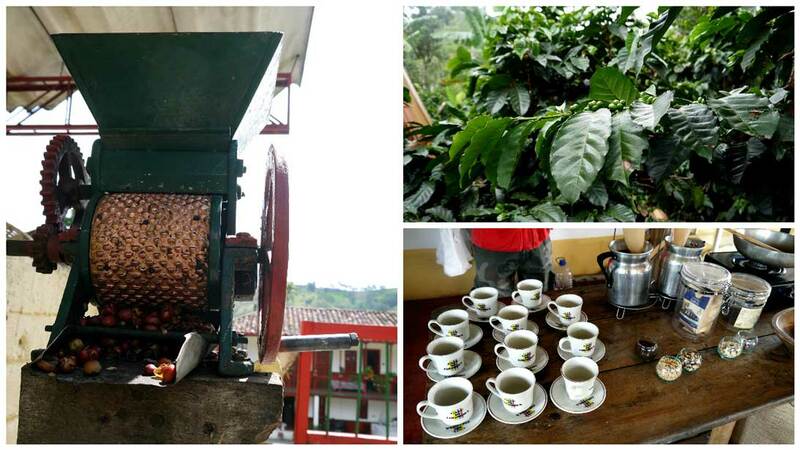 This tiny country was the fourth largest coffee producer in the world in the early 1970’s. Politics and 10 years of civil war gave the industry a knock. Today skilled farmers still produce high quality coffee of good varieties at altitude. El Salvador also produce a lot of cheap lower quality coffee. When I hear El Salvador, I think world’s top murder country, amazing pupusas to eat and amazing cheap coffee. We traveled everywhere on our own in this tiny country and never felt in danger. We drank litres of coffee and ate so many pupusas. The lower quality coffee sold at cheap eateries with papusas was still very drinkable. About sixty percent of the coffee drunk worldwide is produced in Brazil every year! Being a huge producer the quality of coffee varies widely. It is an amazing country with unreal jungles and beaches. This beautiful country poses the perfect climate, soil quality and altitude to produce good coffee. In the most of Brazil people like their coffee very strong, really hot and without milk, they love their coffee very sweet. They call the little cups of thick and powerful coffee ‘a cafezinho’. We spent a couple of weeks traveling on the amazon on cargo boats. The boats had free coffee available, the stuff was super strong and sweet, we drank the black syrupy cafezinhos like tequila shooters! Colombian coffee is often regarded as the best in the world. To produce the world’s best coffee the plantations occur at high altitude between 1500 and 2000m, only ripe arabica beans are hand-picked and a demonitation of origin system is used for quality protection. Colombian coffees are mostly mild coffees, with a well-balanced citrus-like acidity. The heart of Colombian coffee prodution is the ‘coffee triangle’ Salento is located right in the middle of the area. You can read all about our Salento Coffee Experience. Following the coffee making process from bean to cup at Valle de Cocoro, the coffee triangle, near Salento. One of the most famous coffee production areas in the world. 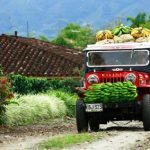 We loved Colombia, hiking, paragliding, white water rafting, but for me the most exiting was visiting Salento and following a bean from the plantation into my cup in the most famous coffee plantations in the world at Valle de Cocoro (the coffee triangle) surrounding the town. Salento is a small, charming colonial town surrounded by green hills and coffee plantations. The Colombian coffee was mild and sweet. This is due to beans being picked very ripe and when making coffee it is not pressed but made by the drip method through a material filter. The most famous international coffee brand from Colombia is Juan Valdes. The coffee is sold all over the world and the Juan Valdes coffee shops are found everywhere in Colombia, the coffee is a bit closer to the Italian espresso style than we drank on the farm, I loved it. So this is where everything started. Ethiopia is the birthplace of coffee. The legend goes that in the tenth century goat herder, Kaldi, discovered coffee when he noticed that after eating the berries from a certain tree, his goats became hyperactive and did not want to sleep at night. He told the monks at his local monastery that prepared a soup from it. The mystic Sufi pilgrims of Islam spread the knowledge of these energy beans to the Middle East from where it spread through the colonial empire. Ethiopia is still the nr 1 coffee producer in Africa and nr. 7 in the world, I still have to visit this coffee mecca. Most of the arabica beans from Tanzania are grown on the slopes of Mt. Kilimanjaro and Mt. Meru. These coffees are called Kilimanjaro or sometimes Moshi or Arusha after the main towns. Tanzania is the thirteenth biggest coffee in the world and produces smooth and full-bodied coffee rich in flavor. In Arusha there are many ‘plant to cup’- tours introducing you to Tanzanian coffee on the surrounding farms. Following my climb up Mount Kilimanjaro I bought fantastic coffee grown on the slopes of the world’s highest freestanding mountain at a local market in Arusha. Turkey does not produce any coffee beans. Turkish coffee is a method of preparing unfiltered coffee. A well-prepared Turkish coffee has a thick foam on the top and does not contain noticeable particles in the foam or the liquid. Coffee is traditionally accompanied by a sweet, such as a piece of rock candy or turkish delight candy. Turkish coffee is described well by a local proverb “black as hell, strong as death, and as sweet as love”. We loved the stuff, served in a small fancy cup with turkish delight candy. 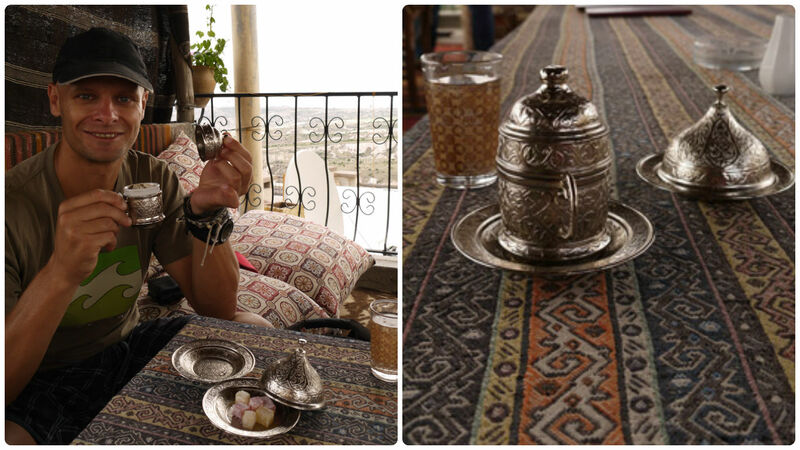 “black as hell, strong as death, and as sweet as love” I loved the fancy little cups and sweets served with Turkish coffee! Europe does not produce any coffee. Coffee can only be grown successfully in The Coffee Belt, a region located between the Tropic of Cancer in the north and the Tropic of Capricorn in the south. Since Italy does not produce any coffee, the best coffee in the world does not come from Italy. They can however be seen as the inventors of modern coffee. Espresso originated in an italian kitchen and most modern versions of coffee are espresso based. Espresso is a specially brewed coffee made by pushing hot water through a layer of finely ground coffee. The water is pushed with a high pressure extracting the caffeine and natural oils. Some of the natural oils in the coffee give espresso its richness and strength. It is not stronger than coffee made by the drip method. The extraction method results in more caffeine extraction. This stove top coffee pot is the original Italian way to make espresso style coffee. I have drunk thousands of cups of coffee all over the world and coffee in Italy is still my favourite. I don’t know where beans for the famous Italian coffee, Lavazza and Illy are sourced but it always makes superb quality espresso coffee. This great coffee is now available in supermarkets all over the world. The Bialetti coffee pot that I bought in Italy is still my favourite way of preparing coffee! Commercial Coffee Production in California? 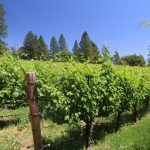 Colombia’s Coffee Boom Touring Napa Valley: Tasting wine where it’s made The Good and The Bali Where to Travel First? We enjoyed your article, Stingy Nomads. Very nice pics. 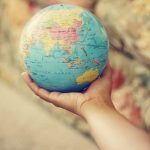 We are big coffee lovers reaching all 7 Continents with 8-years of non-stop traveling – living in the world. We always find time to take a ‘coffee break,’ everywhere we travel with one regret that we passed up. 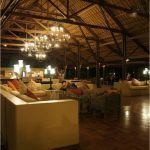 While in Indonesia, we couldn’t get up the nerve to have a cup of ‘Kopi Luwak,’ a once in a lifetime experience on a coffee plantation we toured. Coffee in Italy, Turkey, Vietnam and Penang, Malaysia’s ‘white coffee,’ top our list. Illy, is our #1 coffee – headquartered in Trieste, Italy – its Arabica beans come from 7 nations: Colombia, Brazil, Costa Rica, Guatemala, El Salvador, Ethiopia and India. that is where we tried the ‘poop coffee’ for the first time. Great story and amazing efforts, we would love to interview you at Arabica Coffee Magazine. Thanks for reading our story! Sorry for only replying now, we are traveling in Russia and not always online. Dave getting caught in a rainstorm on a motorbike somewhere in South East Asia is something every travel should experience! Michael that is some nice coffees, thanks for telling me where Illy beans originate! Mohammed we are definitely available for an interview, I sent a message to your magazine.